Isn’t this a pretty image? I love the red chandlier in this room. Unfortunately I can not remember where I found the photo so unfortunately I can’t mention any credits. 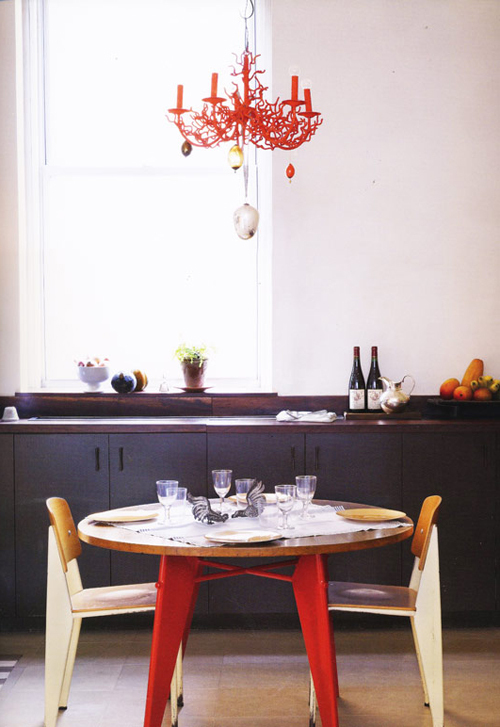 Your timing is perfect – I have just been considering a red chandelier for my dining room. I love it! ik zou met bijna 80% zekerheid durven zeggen dat hij in de 101 woonidieeën stond. I only remembered because I loved its placement with the Jean Prouve table and chairs at the time. LOVE and i think the scale is so cute! and perfectly balanced by the red on the table… very very fun find. The photographer is probably Anita Calero as she is a photographer and stylist and this is her gorgeous Manhattan flat. Ben & Juana, thanks for the update!! what a gorgeous set-up. that red chandelier really adds some punch. Oooooh! Love it! I wonder what my silly cat would do to it!! Heehee!!! !